Step aboard most new cruise ships these days and it’s clear they’ve placed an emphasis on entertainment for kids and young adults. When many think of taking a cruise, they envision a week laid up in a deck chair drinking Pina Coladas and enjoying a good book. 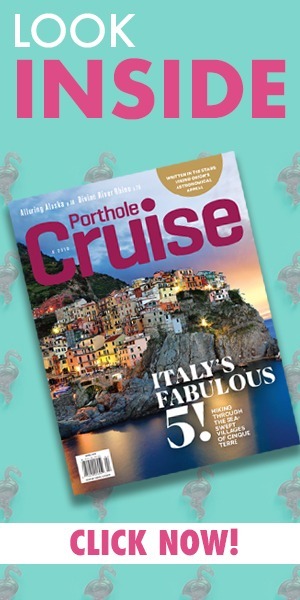 Newer ships certainly offer that paradise for Mom and Dad, but they also offer a plethora of entertainment so can kids have just as much fun as their parents. So, what are the best cruise ships for kids? Read on and find out! 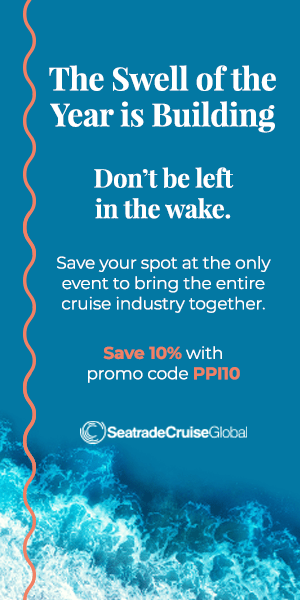 From water slides and go-kart tracks to laser tag arenas and surfing simulators, modern technology has afforded cruise ships the opportunity to turn into floating theme parks with no shortage of fun to be had. There are several ships which fall into the best for kids category, here are some of our favorites! RELATED: Cruising with – and without – kids. 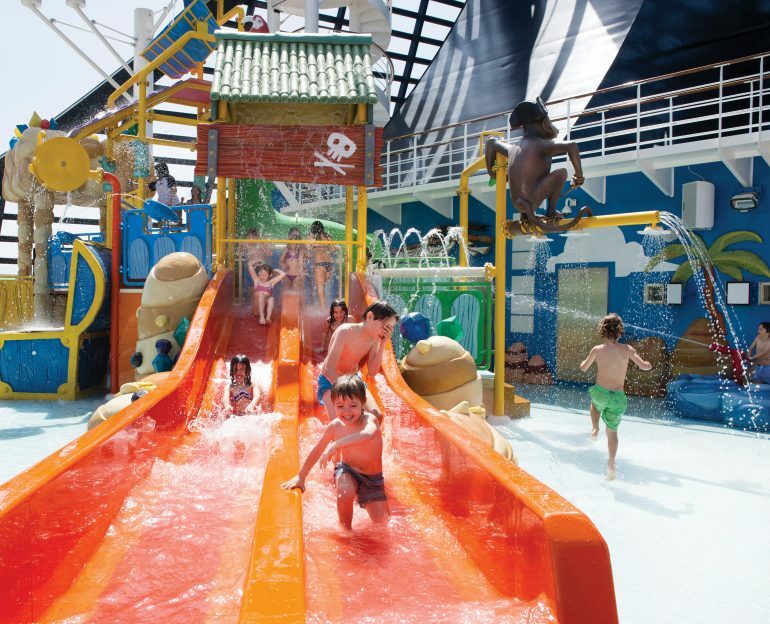 One of the newest cruise ships sailing the seven seas, Royal Caribbean Symphony of the Seas, has everything your kids need to stay entertained and out of your hair for the whole trip. Amenities include a water park just for kids, a regulation size basketball court, ice-skating rink, and two 40-foot rock climbing walls. The ship also has an arcade and a glow-in-the-dark laser tag arena where guests face off for control of the last planet in an epic battle of good and evil. The Flowrider surfing simulator will be a big hit with teens and it’s included in the cost of your cruise, with absolutely no reservation required. 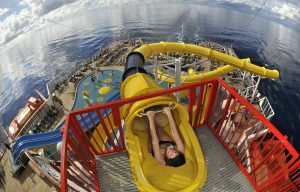 As the name implies, Carnival Cruise Line is all about having fun, especially when it comes to the kids. Carnival Horizon offers fun and excitement for kids of all ages. Suspended two stories above the top deck, Skyride offers an incredible view and some exercise too! It’s a bike ride in the sky your kids will love. The ship also has an IMAX movie theatre with 3D capability and they’re playing all your favorites from yesteryear and the newest releases as well. When the little ones work up an appetite swimming in the pool or splashing through Dr. Seuss Waterworks, Guy’s Burger Joint is the perfect lunchtime spot. And if Mom or Dad need some down time? Just stop into Serenity Adults-Only Spa for some pampering, rest and relaxation. That makes it one of the best cruise ships for kids and for adults. You had to know the happiest place on Earth was going to make the list. 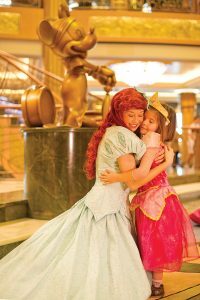 Disney Cruise Line is world-renowned for being a fantastic cruise vacation for kids thanks to that special Disney magic we all love. Fantasy is the newest ship in Disney’s fleet and it’s easily one of the best cruise ships for kids. Aquaduck is a water slide that bring the thrills. 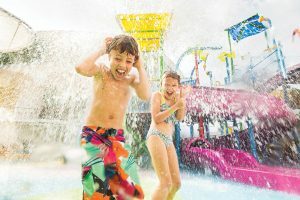 More like a rollercoaster than a waterslide, Aquaduck is an exhilarating ride that takes passengers on a wet and wild journey up, down, around and off the side of the ship, through the Forward Funnel—on a daredevil 4-deck drop. Ride it if you dare! While the kids are playing mini-golf or enjoying the sports center, make sure you keep an eye out for Mickey Mouse and the rest of the Disney gang who love meeting new friends on board!